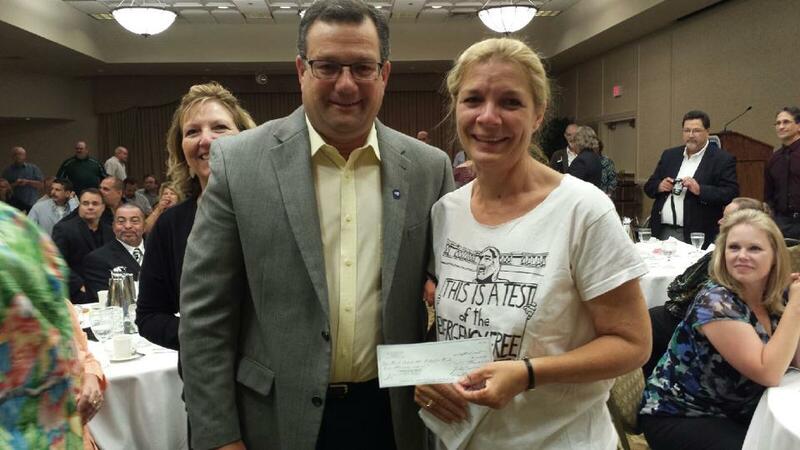 Members of the National Postal Press Association donated $1,000 to the First Amendment Protection Fund at their conference banquet on Saturday night. 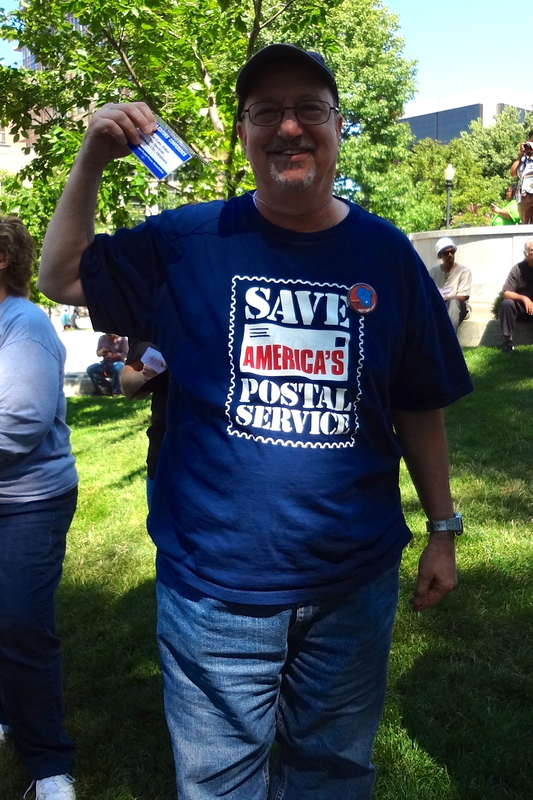 NPPA President Tony Carobine also announced that the American Postal Workers Union had pledged to donate an additional $4,000 to help defray court costs of people who have been arrested at the Wisconsin State Capitol rotunda during the Solidarity Sing Along over the past month. The US Postal Service is the second largest civilian employer in the country, and postal workers are under attack. From cuts in insurance benefits and reduction of service hours to closures of rural offices and mail processing facilities, postal workers are facing battles on multiple fronts. 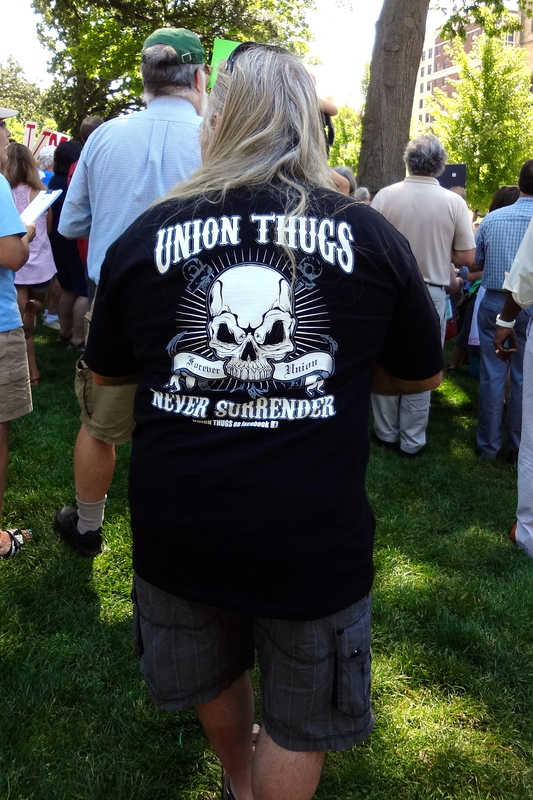 The biennial gathering of postal union newsletter editors, most of whom are volunteers, seemed to be buoyed by the spirit of defiance and struggle for workers rights that is alive and well in Madison. NPPA Secretary-Treasurer Edward Brennan (left) is joined by other members. Jim Gabe, Editor of The Spectrum, Oklahoma City, OK.
Part of the crowd during Friday’s Sing Along. The presentation of the check was made by NPPA President Tony Carobine to Mary Ray Worley, who organized Sing Along participants to share some of their songs with the group of editors from the NPPA. 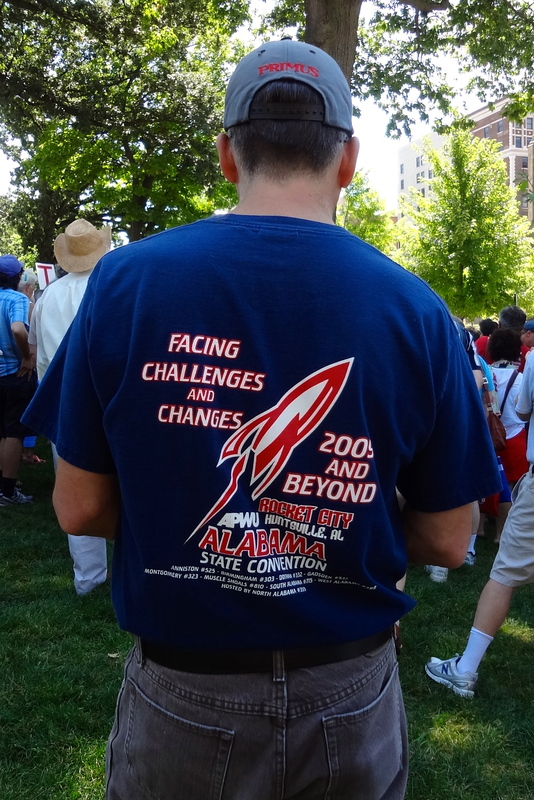 Mary’s husband Tom Ray Worley is a member of the APWU Local 241. “More than one person told me that going to the Sing Along on Friday was the highlight of the conference for them. They were really inspired,” said Worley. More than 150 people have been issued $200.50 citations over the past month, some of them multiple times for a total of nearly 300 citations. Most of those people have already requested or will be requesting jury trials. The fee for a 6-person jury is $36. In addition, several other people have been arrested on misdemeanor obstruction and/or resisting charges, including the editor of The Progressive magazine who was doing his job as a reporter at the time. In total over $70,000 in fines and court costs have been racked up by people willing to face down the harassment and intimidation tactics of Governor Scott Walker’s administration and assert their constitutional right to express their grievances in the traditional public forum that is the Capitol rotunda. The postal workers’ generous donation of $5,000 in financial support is not only a material boost for the people who are on the front lines of fighting for first and fourth amendment rights in the Capitol; it also represents an enormous gesture of solidarity between a large labor organization and those at the epicenter of daily struggle against Scott Walker, one of the biggest union-busters in the country. 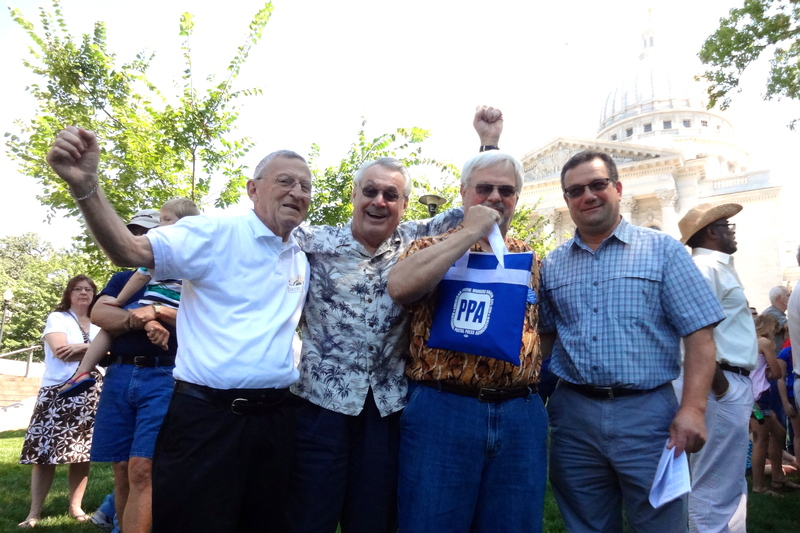 I attended the PPA conference and the Capitol singers were the highlight of the conference. 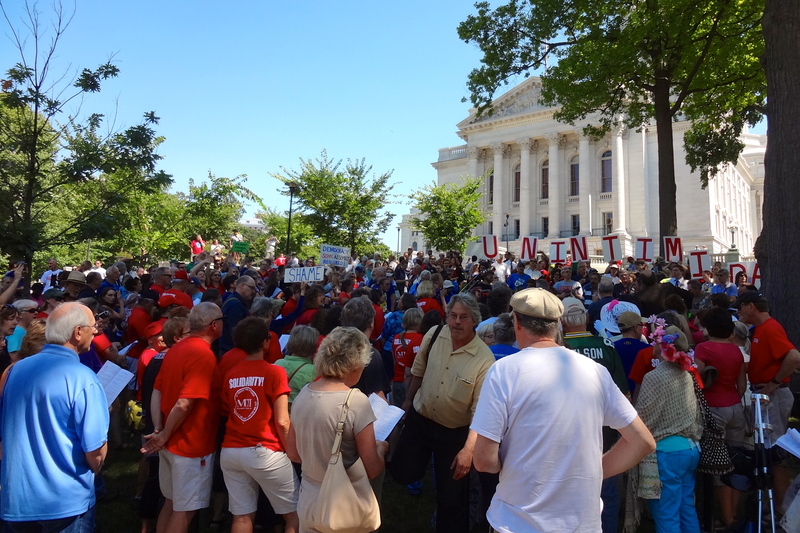 While postal workers are losing jobs daily the union is off conducting sing-alongs ….great!